The TSA has awarded $245M in contracts to three of OSI competitors in the body scanner market Rapiscan / OSI Systems Inc. (Hawthorne, CA) has been the predominate supplier of human body scanners to the TSA for deployment at the major US airports. These machines operate using backscatter x-ray to create a naked full body image, and have been the subject of numerous complaints and a few lawsuits. The new machines use a lower energy radio wave similar in power to a cell phone. These millimeter wave machines will also only show a generic person outline with highlighted yellow blocks where something is detected. The earlier backscatter machines have already been exchanged for the millimeter scanners at Boston Logan, LAX, Chicago O’Hare, Orlando and JFK in New York. 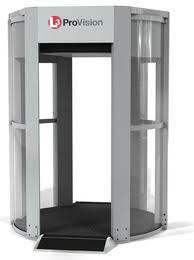 The older scanners will be re-deployed to smaller, regional airports that have lower traffic volumes and are still lacking any body scanners. OSI initially received a $170M order from the TSA for the scanners that have been built and installed since 2010. In September 2012, the TSA announced that three OSI competitors would receive $245M to develop the next generation scanners for US airports. American Science, Engineering, Inc, L-3 Communications and Smiths Detection Edgewood Inc are now in research and development for the next-generation imaging technology to more accurately detect contraband, weapons, improvised explosive device components and other potentially dangerous materials.